PTi offers several options for Slitting, Coating and Winding sheet. Slitting systems include both rotary and razor style slitters depending upon the application. High crystalline polymers perform best with a rotary style slitter whereas, soft flexible polymers works well with razor style. 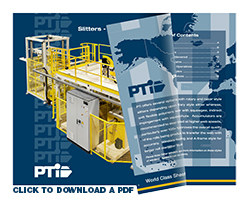 Coaters include simple submersion style with squeegee, indirect impingement with squeegee and a controlled transfer roll coater that is featured in this brochure. Accumulators are recommended to stop the sheet for safely operating the winding equipment. It is recommended at higher web speeds, particularly over 100+ fpm to aid in the proper transfer and handling of the sheet. This also improves the overall quality of the rolls being produced as sheet tension is maintained and the operators have ample time to transfer the web with accuracy. Winders featured herein, include Cantilever style which eliminates core-rod handling and A-frame style for larger roll diameter build-up. Please Note: Other winders are available including Fixed Shaft, Turret style and Fully Automatic. Systems can be configured for handling 1 - 3+ webs simultaneously depending on your specific processing requirements.